Successfully Added Flashmax X960 CREE LED Flashlight w/ Adjustable Beam (Full Kit) to your Shopping Cart. Amazing power from a pocked-sized CREE LED flashlight! This pocket sized CREE LED flashlight produces an impressively bright light that’s powerful enough to replace your medium to full-sized LED flashlight. It features an adjustable head for focusing the light into a narrow beam— great for finding small items in pitch dark locations. Or you can increase the diameter of the beam for illuminating large indoor or outdoor areas with ease. However, this is only the beginning of what this powerful little flashlight has to offer. The magic behind this CREE LED torchlight is the highly efficient Q3 CREE LED. This is the same CREE LED found in popular name brand torchlights such as Surefire, Fenix and Streamlight. The result is an amazingly bright 160 lumens output— enough power to use as your primary home or travel flashlight. The amazing part is that they somehow managed to pack all of this power into a pocket-sized flashlight, when traditionally only full-sized torchlights could take advantage of such powerful LEDs. So how did they do it? The G273 uses a specially formed lens and optimized reflector to achieve some pretty impressive throw results-- despite its compact design. 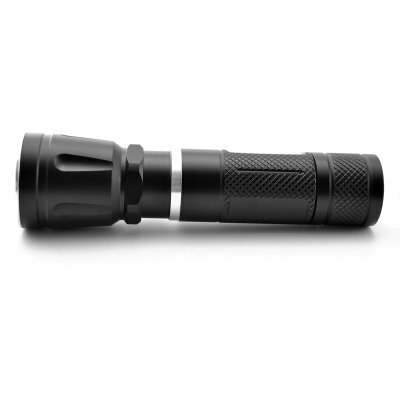 The body of this torchlight is forged from type III hard anodized aircraft grade aluminum which provides exceptional durability even in the most demanding environments. So whether you’re camping 500 miles away from home- deep in the wilderness, or exploring a 5 mile pitch dark cave, the G273 will always be ready to provide you with exceptional lighting performance when you need it most. The back of this device features a click button which allows you to select from 3 different light settings. There’s a low and high output setting as well as a "flash" setting for signaling to others in case of an emergency. On the maximum output setting the batteries will last up to 5 hours on a full charge, and on the low output setting they can last up to an incredible 12 hours nonstop! What’s more, the powerful LED in this flashlight has an operating life of over 50,000 hours, that’s over 5 years of nonstop use! A more practical example would be an entire lifetime worth of moderate everyday use. Durable and compact design, long throw reflector, powerful 160 lumen CREE Q3 LED, and adjustable beam size. All this from a pocket sized EDC (every day carry) flashlight and at a price that’s 80% cheaper than the same OEM model. This is a great chance to get yourself name brand quality at a fraction of the cost. And as an added bonus we’ll even include the powerful ICR18650 rechargeable battery and a dual battery charger, absolutely free. Order yours now while supplies last and we will send out your new CVFR-G273 LED flashlight within 24 hours and will even guarantee your product free from defect for an entire 12 months. Form Factor: Handheld torch style with tail click power button. This product is not waterproof therefore cannot be submerged under water. These are better since they cost a fraction of what a comparable MagLite torch would cost and are just as good in terms of performance and reliability. This CREE LED torchlight also comes with Chinavasion's famous hassle-free 12 month warranty! Does the Flashmax X960 really come with a charger and 18650 rechargeable battery for such a low price? YES! We are giving you the factory direct wholesale price. Search the internet, you cannot find a complete kit with a 160 lumen Cree LED flashlight + charger + batteries for a lower price! I got 2 of these. VERY GOOD! Perfect!! !